1 . JewelryAndFindings offer processing service according to your requirement? A) Jewelry Findings ---- We can divide and pack the Jewelry Findings which are counted by weight in JewelryAndFindings, in accordance with your appointed weight. B) Chains ---- We shall divide or coil Chains onto a spool based on your desire. Please note: The chains may be loss after division. 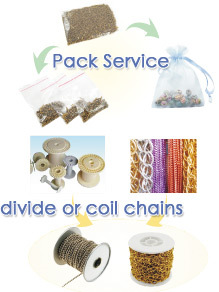 C) Thread & Cord: We can divide the thread or coil thread onto a spool according to your request. 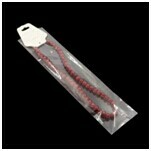 D) Card: We can put the beads strand, bracelet or necklace etc. in card according to your request. Put the jewelry strands in a card: 0.1USD/strand. Per 1 strand more, 0.05USD more. E.g.If you want to put 3 strands in one card, you should pay 0.1+2*0.05=0.2USD for the processing fee. E) Wholesale beads and Findings --- For the wholesale beads and findings which are counted by amount, well especially assign people to divide and pack them according to required amount. Please refer to the attachment of Jewelry Findings Processing Services Fee Table. F) Others ---- Besides what is said above. Note: The above quotations has include the material fee, such as bags, spools, etc. (Except the chain’s processing). If you have any question on processing services, please do not hesitate to contact sales@jewelryandfindings.com.